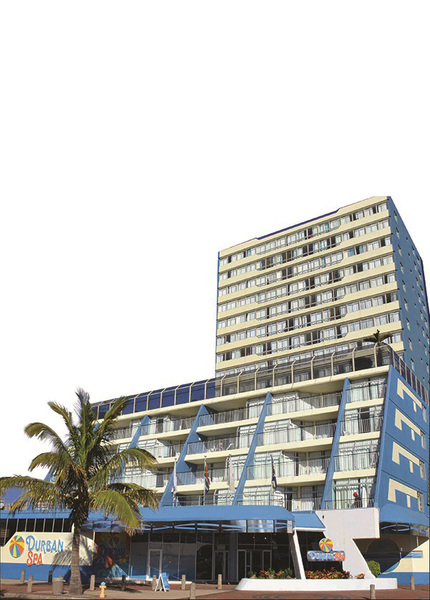 Durban Spa Holiday Resort is situated in Durban, KwaZulu-Natal and offers accommodation in 2 - 8 bedroomed condos. The 2-bedroomed condos or studios have a double bed, sleeper couch, lounge, kitchen, air conditioning, microwave, dishwasher, partial sea views, bathroom, and MNet.The 4-bedroom has double and twin beds, sea views, and the same amenities as the studios.The 8-bedroomed condos hastwo bedrooms, two bathrooms, and the same amenities as the other rooms. The 6-bedroomed condo has one bathroom, a balcony in some, and the same amenities as the others. Durban Spa Holiday Resort also offers 24-hour reception, a beauty salon, hairdressing salon, games room, jacuzzi, table tennis, heated swimming pool and garden. Activities and attractions in Durban include whale and dolphin watching, sailing, kite surfing, walking, surfing, bird watching, the Mangrove Swamps, Durban Botanical Gardens, National Science Museum, uShaka Marine World, Sharks Board, Big Swing at Moses Mabhida Stadium, Cato Manor Heritage Centre, Durban Harbour, Francis Farewell Square, and Giba Gorge Mountain Bike Park. for Durban Spa Holiday Resort.